fascinating history, and world-changing science and technology development. 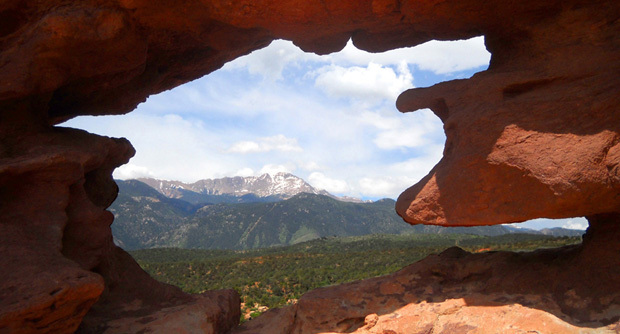 in the road, bend in the trail, and visit to one of our many attractions ." 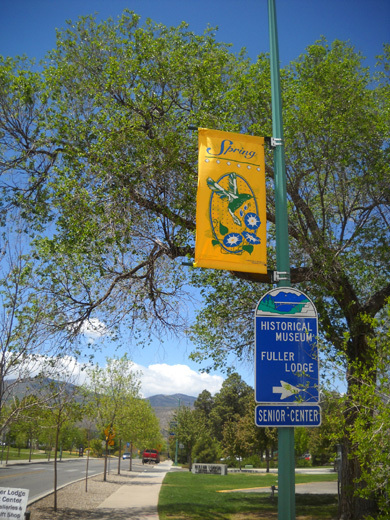 Colorful banners all over town proclaim, "Los Alamos: Where Discoveries Are Made:"
As the opening quote illustrates, "discoveries" can take on many contexts in the Los Alamos area from early Native American inhabitants to 19th Century homesteaders, 20th Century scientists who pioneered technological inventions like the atomic bomb, and 21st Century visitors like Jim and me who delight in finding awesome scenery, great trails, historical sites, and whatever else interests them. 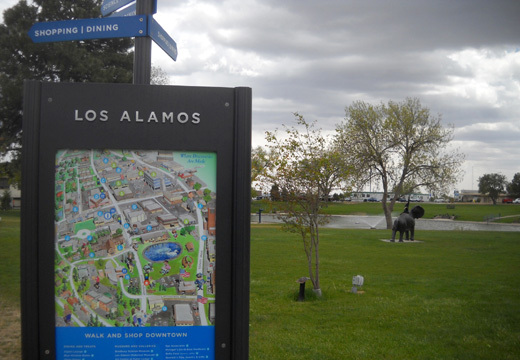 This is our fourth visit to Los Alamos and the third year I've included information about it in our web journal. Each year we find something new and interesting here to report on. I also like to feature new photos of the same places we've enjoyed previously. 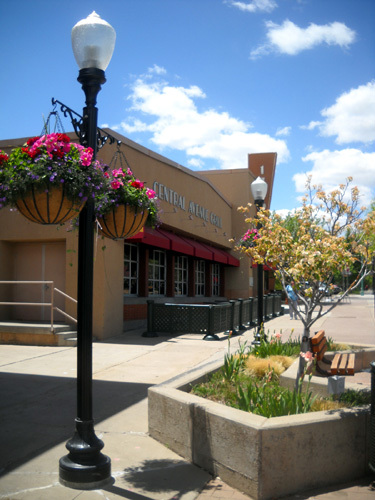 That's the purpose of this entry -- a few different photos from a short walking tour downtown that I took this afternoon around Ashley Pond, Bathtub Row, Fuller Lodge, an ancestral pueblo dwelling, and Central Avenue near the Post Office. 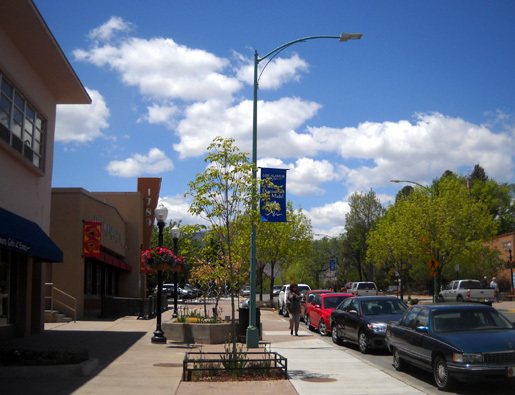 There is much more information about this part of town in my May 13, 2009 entry. I promise to be more brief here! While Cody and I walked around a few blocks, Jim visited the Los Alamos Historical Museum and Bradbury Science Museum. Those are also featured in the 2009 link above. 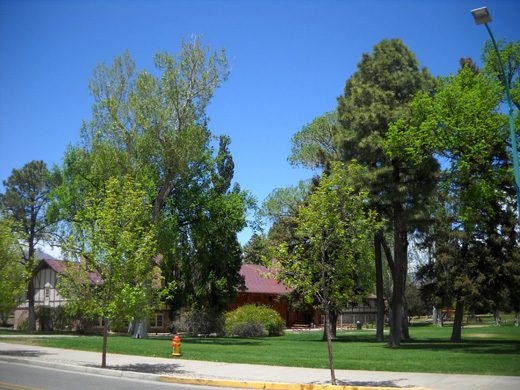 Three decades before the Army Corps of Engineers took over the mesa on which the town of Los Alamos now stands, a man named Ashley Pond bought a ranch that was located here and turned it into the Los Alamos Ranch School. This prestigious early 1900s boys' school combined rigorous academics and challenging physical activities. 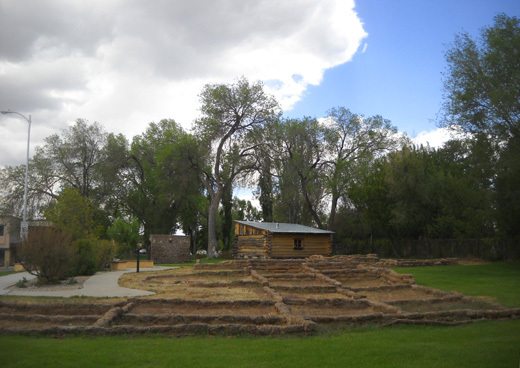 Several buildings from the Ranch School remain, including Fuller Lodge and the nearby Historical Museum. 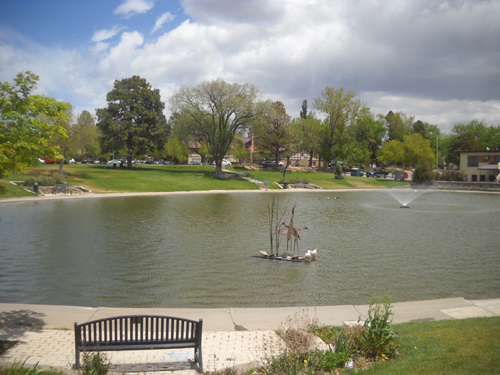 The boys at the Ranch School used the pond for year-round recreation. In the winter blocks of ice were also cut from the pond and stored in an ice house. That structure no longer exists. A memorial stands at the site, which was the location of the labs where the Trinity nuclear components were built during WWII. 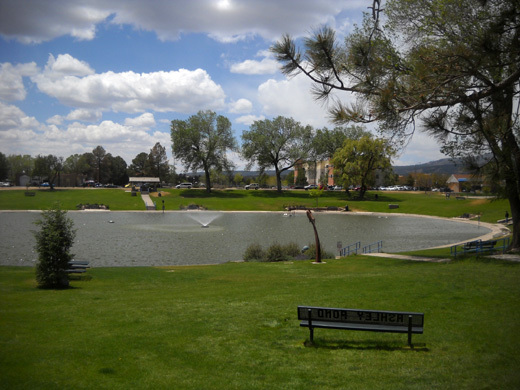 In quite a contrast, the pond is now an idyllic setting for residents and visitors to Los Alamos. 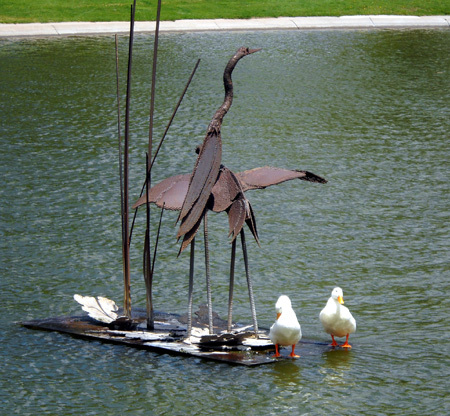 Folks of every age stroll around its perimeter, sit on the benches to watch the ducks and fountains, or enjoy a picnic lunch on thick green grass among the Art in Public Places sculptures scattered over the grounds. What a nice park! Hard to believe that atomic bombs were made right here. 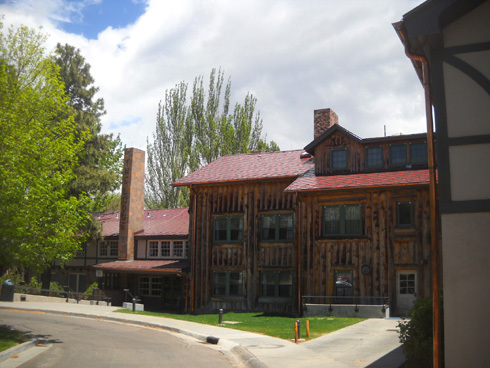 When it was built in 1928 the first floor served as the Ranch School's dining room and kitchen; it also contained guest, staff, and nursing quarters. I don't know what it was used for during WWII when the government took over the property. After the Manhattan Project moved out in the late 1940s, wings were added and the building was turned into a hotel. 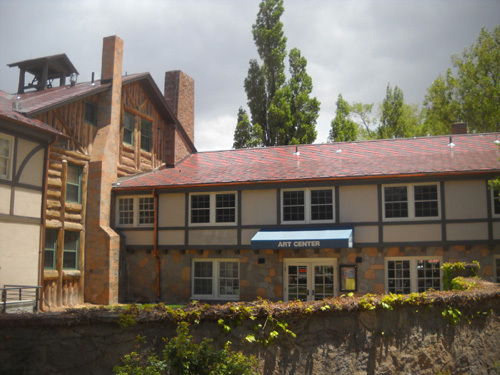 I've never visited this non-profit visual arts center so I decided to check it out this time. 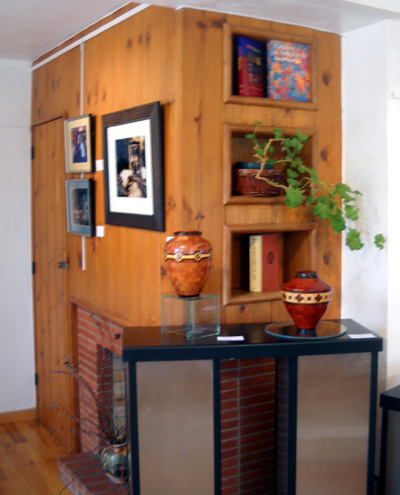 Jewelry and other locally produced artwork is also for sale. 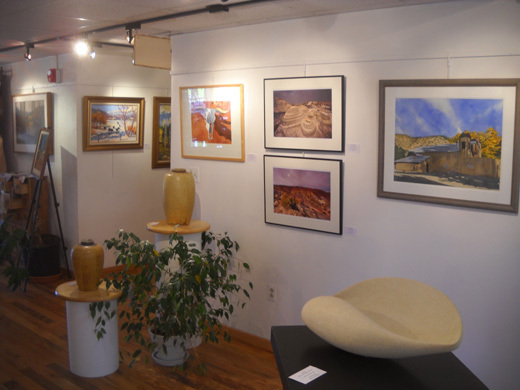 That's just a small sampling of the things you can see in Los Alamos. 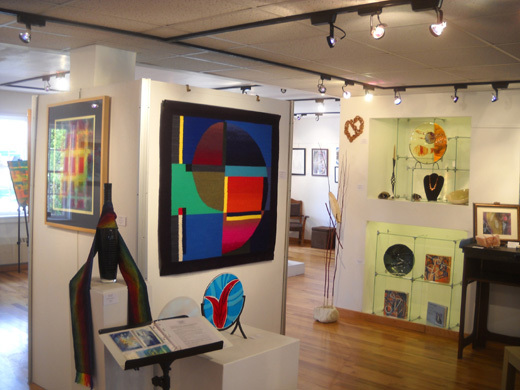 The Chamber of Commerce is a good starting point for any visitors to the city -- first, their website, then their visitor center on Central Avenue near the Bradbury Science Museum. 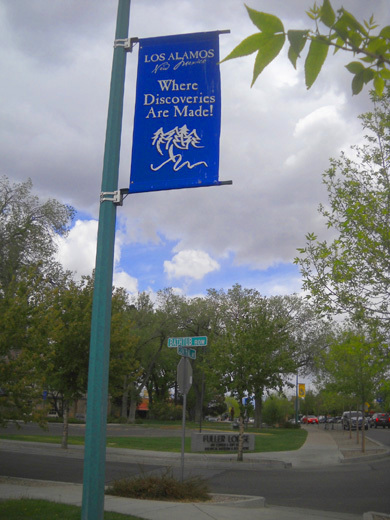 Although you may need wheels to see all of the city, the best way to see a wide range of local history is to follow the 12-block long downtown walking tour route for an hour or two.